From the Butterfield Overland Express of 1865 and the Wilson station of the Union Pacific Railroad in 1868, to the "Czech's" Bohemians of 1874, this town has gone by three different names. At first it was known as Attica, then Bosland, then was named "Wilson" by the U.S. Post Office in 1874. 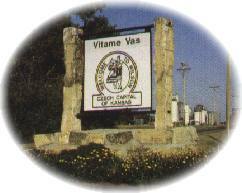 Wilson is known as the Czech Capital of Kansas because of the heritage that settled here. Occasionally one can meet citizens of Wilson who still know the native tongue. The Czech's are known for their hard work; which is represented in the quarried post-rock one finds in the buildings and fence posts. Today twenty-two of those buildings are still standing and many house businesses nearly 100 years later. Wilson is the Gateway to beautiful Lake Wilson, which is a man-made lake of 9,000 acres of clear blue water. One can enjoy fishing, boating, camping, nature walks, and swimming. The third building for the St. Wenceslaus Catholic Church was erected in 1911 of veneered brick. It is named for Svaty Vaclay, St. Wenceslaus, the patron saint of Bohemia. Located in Downtown Wilson in the city park by the railroad right of way is the World Wars Memorial in memory to those soldiers and marines who lost their lives during the wars.